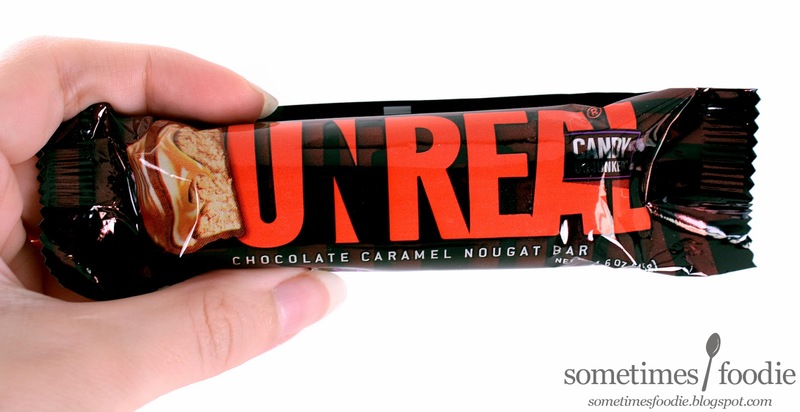 Due to their redesign, I thought it was time to revisit Unreal candy. If you check out my other reviews you can still see some the older packaging, which I really liked. If you look at my older photos you can see that the only thing that was changed was the company's logo, which sounds minor, but it has completely changed the packaging in my eyes. The original stylized logo is what drew me to this line in the first place. The graphic designer inside me is crying over such a change, the packaging was so creative and interesting with the older logo, but I understand why changes had to be made. From a marketing standpoint, the enigmatic logo might have confused some customers as to what the product actually was, which can damage sales. By having a more legible label it can appeal to the masses. Personally I think the enigmatic logo would have worked well in a different market, such as graphic designers, museums, and specialty supermarkets, but with this economy I am guessing a change had to be made so that this product could do well at the local everyday grocery store. What a pity. As far as the candy itself, nothing has changed. Unreal still delivers real chocolate and candy ingredients, so let's see how this specific flavor tastes. Once the wrapper has been removed you can see just how smooth and perfect the chocolate coating is. 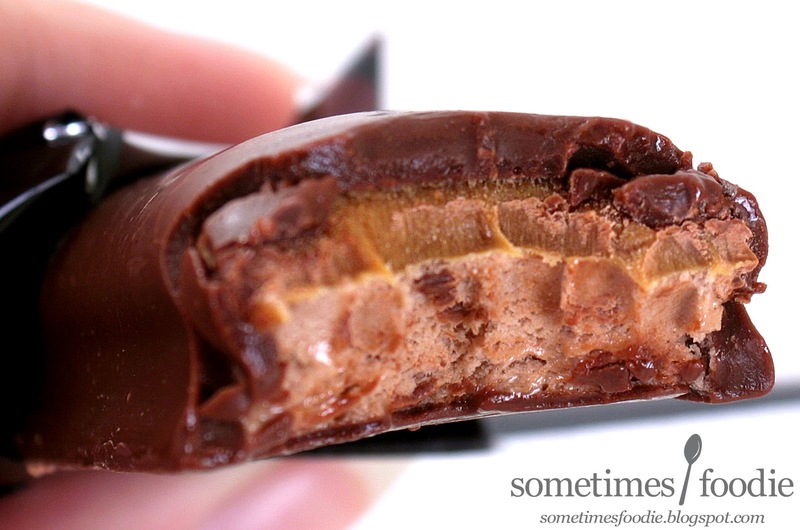 In case you didn't know, the little designs you see on top of Snickers and Milkyway bars aren't natural imperfections, they are purposefully made to give the top of the candy bar texture and a "homemade" look. This candy bar was enrobed in chocolate perfectly without any attempt at making it look like it's commercial peers. I like the smooth appearance, although the flat surface did come off as a little boring in photographs. At the end of the day this is candy and it's meant to be eaten, not looked at. The chocolate smells sweet, milky, and a little malty. Since I absolutely love malt balls I found the scent to be very appealing. I took a bite, and the bar pretty dense. The first thing you can taste is the chocolate coating, which is just the right thickness to add some creamy texturing and sweetness to the candy bar. After that you have to start chewing. This filling is dense and thick, so there is no way it's just going to dissolve in your mouth. As you chew you can taste a thin, sticky layer of caramel and a thick layer of nougat. I was pleasantly surprised by just how malty the nougat tasted. I absolutely loved it, but non malt-lovers might feel differently. Now, I am the kind of person who buys bags of "fun" sized candy bars. I tell myself it's better because I can control my portion size, which would be true...if I did it. I always end up eating at least 3 per sitting. (Don't judge me.) After finishing this candy bar I honestly felt really satisfied. I had more than one package in my review pile, but one of these candy bars was actually enough.